Dog’s Best Collection is inspired by two things: our genuine love for dogs and our desire to provide them with the highest quality of life possible. It started in 2010 with our founder, Rick Pack. 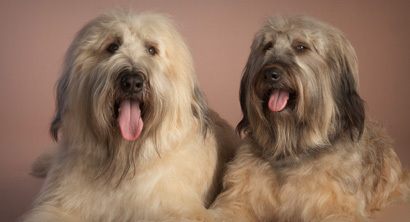 As a loving dog owner, Rick was simply looking for a balanced, high quality, nutritional dog food for his two Briards that would best meet their needs for a healthy and vibrant lifestyle. Due to the poor quality of dog food being sold and with the dog food recalls at the time that were causing fatalities and health issues, Rick was determined to find a safer and better product for his beloved pets. His search brought him to what can only be described as a gift from “Life” – Great Life Pet Products that is. What Rick stumbled onto was a local, California company producing a line of dog food that was of the highest quality and standards available on the market. And he discovered something wonderful, “Not only did my dogs love the food,” Pack comments, “but I began to see remarkable improvements in their health, their coats and their well-being.” His friends began remarking how beautiful and healthy his dogs looked and wanted to know what he was feeding them. Soon after, Dog’s Best Collection was formed. Rick’s zest for finding high quality products for dog’s led him to focus on three core areas – Nutrition, Health, and Lifestyle. Dog’s Best Collection now carries an array of products ranging from hand-built ceramic bowls, to nutritional supplements, natural healing products, and of course dog food. All of our products are hand-picked by Rick Pack himself and are guaranteed to be environmentally safe, ecologically pure, non-toxic, and will add to the quality of your dog’s life.